ATTORNEY RICHARD WELTMAN RECOGNIZED FOR OUTSTANDING SERVICE BY NEW JERSEY'S FEDERAL BANKRUPTCY COURTS. FAIR LAWN, NJ - Richard E. Weltman, a New York and New Jersey business attorney concentrating on creditor protection, debt relief, and business counseling, and founding member of the law firm of Weltman & Moskowitz, LLP, was recently acknowledged by the United States Bankruptcy Court for the District of New Jersey for his service to New Jersey's low-income consumers in need of debt relief and bankruptcy services. Mr. Weltman, on the court's bankruptcy pro bono panel for more than 20 years, was recognized by Chief Bankruptcy Judge Judith H. Wizmur and Bankruptcy Judge Morris Stern for his "valued contribution and continued efforts" to pro bono service. "We're excited about our long-term collaboration with the New Jersey bankruptcy courts and Northeast New Jersey Legal Services," said Richard Weltman, chair of the firm's pro bono committee. "It's our hope that, as more low-income clients become aware of the positive impact of the court's pro bono program, we will continue to positively impact the residents of Northern New Jersey and provide assistance to the desperately underserved." 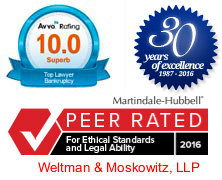 Weltman & Moskowitz, LLP, provides advice and counsel to regional, national and international clients with legal and business needs. The full-service firm concentrates on creditor's rights, reorganizations, bankruptcy and business litigation, technology law, dispute resolution, shareholder and partner disputes, and transactional matters. The firm has offices in New York City, Syosset, and Fair Lawn, New Jersey. For more information about Weltman & Moskowitz, visit www.weltmosk.com, or call Richard Weltman or Michael Moskowitz at 212.684.7800 or 201.794.7500.